Pyaasa (English meaning: “Thirsty”, 1957) is probably the most famous work of celebrated Indian filmmaker Guru Dutt. Dutt, whose real name was Vasanth Kumar Shivashankar Padukone, was a spectacularly successful actor-director-producer of Hindi-language films during the 1950s and early 1960s; and over the course of his all-too-short career, he more or less established the style for popular Indian filmmaking that was to flourish in the succeeding decades. Among all his successes, Pyaasa stands out for many Indian viewers as Dutt’s monument, because it was a box-office smash as well as a hit with the critics, both domestically and internationally [1,2]. Despite these accolades, as well as Pyaasa’s undeniable charms, however, I believe that Dutt’s subsequent, and somewhat thematically comparable, Kaagaz Ke Phool (1959) was a superior film. I will comment further on how those two films compare, below. One key point of commonality between the two films is that their respective main characters (both played by Dutt) are both self-destructive and feel powerless to overcome their doomed fates. In fact the two films fall in line with a popular narrative theme that goes back to the famous novella, Devdas, by Bengali writer Sharat Chandra Chattopadhya published in 1917. This story about a self-destructive main character who bemoans his fate has been filmed many times, most famously the 1955 film Devdas directed by Bimal Roy ; but its story was also an underlying current in Kaagaz Ke Phool. 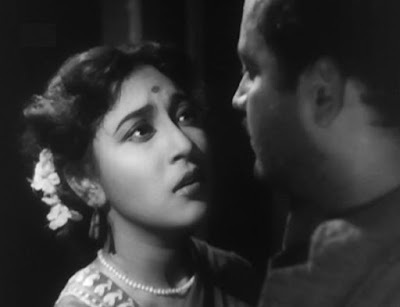 In all three films (Devdas, Pyaasa, and Kaagaz Ke Phool ) the main character feels blocked by circumstances and consequently withdraws from the world around him and descends into tragedy. 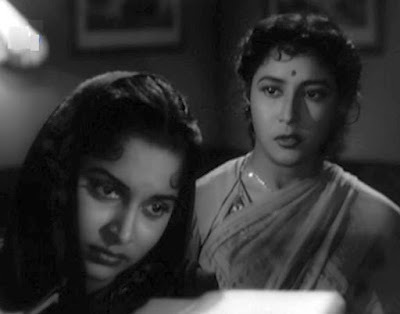 Of those three, however, Pyaasa does conclude with a decisive action, of sorts, on the part of the protagonist, which perhaps account for its greater popularity with mass audiences. narratively-embedded songs. 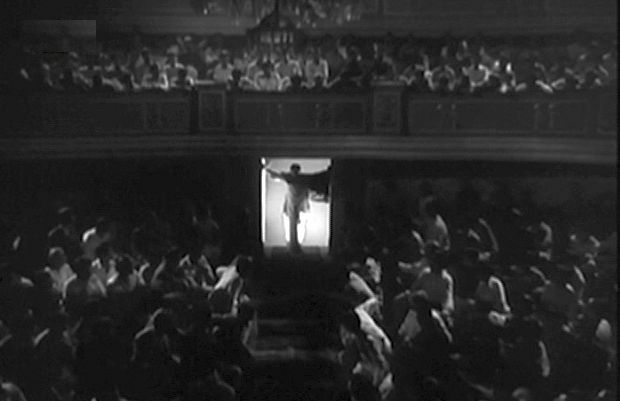 This was a particularly significant aspect of Pyaasa, since a major thematic element of the film is poetry and its expression of social protest. Many of the major songs in the film are presented as poem recitals in musical form. The story of Pyaasa is about a destitute but talented poet who feels out of step with the world around him. We could say that his poetic sensibilities make him too sensitive to the petty cruelties that we constantly encounter in everyday dealings. The narrative dwells persistently on the poet’s dissatisfaction, but it does pass through four stages in its relentless descent. “Call that gibberish poetry? It’s a crusade against unemployment. . . .
And this is a key element to the film. We often expect poetry to be about love or nature, but evidently Vijay’s poetry often takes the form of social protest. This element of social commentary distinguishes Pyaasa from the usual Devdas line of personal suffering and perhaps helps account for some of Pyaasa’s persistent popularity. Vijay is not just complaining about his own problems; he is protesting about the injustice in this world. At home, although his mother still loves him, his two brothers reject him as a useless scrounger. They throw him out of their family home and sell his accumulated poetry for scrap paper. When Vijay rushes to the scrap dealer to try and retrieve his papers, he learns that they were purchased by an unknown woman who was fascinated by the poetry. 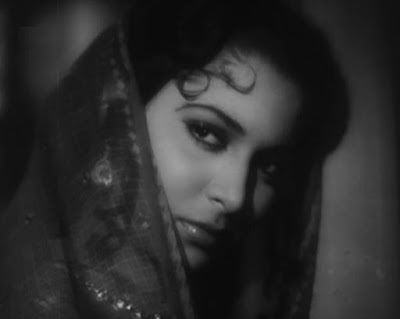 Later when Vijay is sleeping on a park bench, he overhears a streetwalker named Gulab (Waheeda Rehman in her first starring role) singing his poetry, and he follows her. She tries to lure him for “business” to her apartment, but she kicks him out when she learns he is penniless. After Vijay is gone, Gulab notices a paper dropped from his pocket containing some poetic lines, and she realizes that he is the poet whose papers she had purchased from the scrap dealer. Sitting on another park bench, Vijay happens to see from a distance his old flame, Meena (Mala Sinha). Although much of his poetry complains about the world’s injustice, it was apparently inspired by a failed love affair with Meena. Vijay lapses into a flashback about his old days at college with Meena, but the flashback is poorly cued. This poor signification of scene transitions, particularly time transitions, is in fact a general weakness of the film, and I will comment more on that below. At a small café, Vijay doesn’t have enough to pay for a bite to eat, and he is about to be thrown out when Gulab suddenly shows up and pays off the cashier for him. She says warmly that she knows him from his poems. But another major weakness of Vijay (and all the other Devdas characters, for that matter) is his pride. Feeling threats to his dignity, he rejects her act of “pity” for him. I have commented elsewhere on the pseudo-concept of “dignity” , and I won’t belabor the point much here. At this point comic relief enters in the form of cinematic buffoon Johnny Walker (Badruddin Jamaluddin Kazi), who plays the role of pimp and massage oil salesman Abdul Sattar. 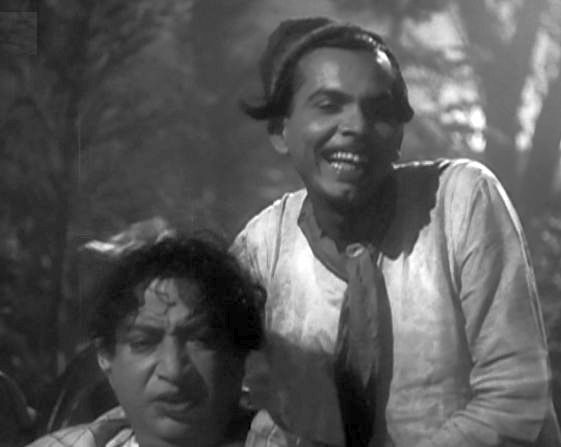 Walker, who was a friend of Dutt’s and appears in many of his movies, usually plays the role of an utterly inebriated (even though in real life Walker was a teetotaler) cartoonish and effeminate character, and I found his appearances irksome in Devdas and Kaagaz Ke Phool. Here, however, he is much more tolerable, since his role in the film fits in with the narrative a little better. Walker here sings (of course in playback by Mohammad Rafi) about his massage-oil’s virtues, and, ridiculous though it was, it was my favorite song in the film . Later Vijay is induced to attend a college class reunion, where he runs into Meena. He is invited to recite one of his poems, and he sings a sad lament about his broken heart, which evokes silent tears from Meena who is looking on. Meena’s husband, Mr. Ghosh, is also present as a former classmate; and upon seeing Meena’s tears, he becomes suspicious about her relationship with Vijay. To find out more, he offers Vijay a job. 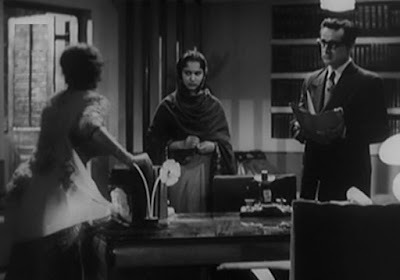 Vijay, aware that Ghosh is a wealthy publisher and not knowing that he is Meena's husband, willingly accepts the job offer, even though it is only to be as a servant. These words only inflame Vijay’s attitudes about how selfish and corrupt everyone is, and whatever tenderness he may have felt for her now appears to be gone. Ghosh breaks in on them and accuses his wife of being a tramp and fires Vijay from his job. Things only get worse for Vijay. Homeless and jobless, when he learns from his scornful brothers that his mother has passed away, he sinks further into depression. He goes to visit his jovial, but cynically selfish, friend Shyam, where he sometimes bunks out, and immediately drowns himself in alcohol. Then he runs out into the street and sings another famous poem lamenting the corruption of this world as it is manifested in urban prostitution areas. But the emphasis of concern is on dignity. Where are they the guardians of dignity? Where are those who claim to be proud of this land? Summon all the leaders of this land. Show them these devious streets. Gulab finds Vijay in a drunken state and takes him back to her apartment, where he passes out. The shadow-laden cinematography in these scenes is particularly effective here. Vijay wakes up while Gulab is sleeping, composes a brief suicide note, and then departs. Vijay then goes out to the railroad yard tracks and gives his coat to a beggar in preparation for his departure from this world. A train comes down the tracks, and it appears that both Vijay and the beggar are killed. The suicide note is apparently discovered, and a news item appears the next day reporting Vijay’s death. Gulab decides to collect all of Vijay’s poetry and goes to Ghosh publishers to get it published. There she encounters Meena for the first time, and their contrasting personae are now in the same frame. The respectable and wealthy Meena is disdainful of the streetwalker Gulab, but Meena’s gold-digging marriage is not so remote from what Gulab does for a living. And while Gulab selflessly offers her life savings to get the poems published and honor the man she secretly loved, Meena selfishly attempts to prevent their publication. In the end, Ghosh accepts Gulab’s offer and publishes the poems. The book immediately becomes a runaway bestseller with the public, and the dead poet is lionized as a cultural hero. For about eight minutes of the film, there has been an assumption that Vijay is dead, but then there is a cut to a hospital ward showing Vijay prostrate and mute, but alive, in a bed. 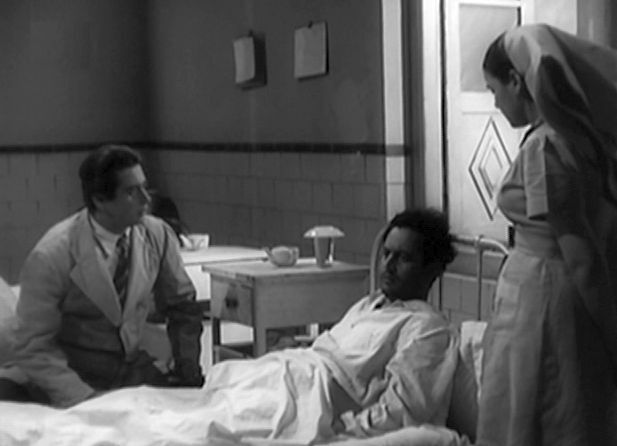 The hospital attendants do not know who their patient is, and when Vijay eventually revives (by hearing a nurse recite his own poetry) and says he is the poet, they all think he is mad. They immediately have him locked up in an asylum. Meanwhile Ghosh, Shyam, and Vijay’s loathsome brothers are quarreling among themselves concerning how to share the loot from Vijay’s publishing sales. They are summoned to the mental hospital to verify Vijay’s identity, but they all look at Vijay and say he is an imposter. They prefer to keep Vijay out of the picture and keep the money for themselves. Eventually with Abdul Sattar’s help, Vijay does escape from the asylum and anonymously manages to get to an auditorium commemorating the first anniversary of Vijay’s death. 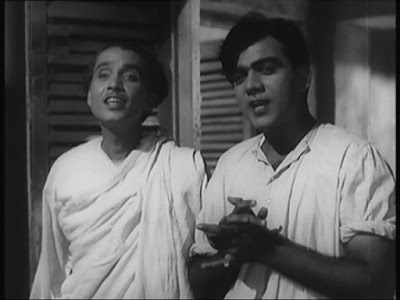 Ghosh is there giving a hypocritical oration, but he is interrupted by Vijay from the balcony, who recites his most bitter condemnation of a soulless world. For what will it profit a man if he gain the world? The world where life is considered trivial. A world where the young are groomed for the marketplace. Burn this world, blow it asunder! Take this world away from my sight! This world belongs to you, you keep it. Since almost everyone that Vijay sees is out for his or her own selfish pursuits, his thoughts have now moved from frustration with his own personal circumstances (romance, family, joblessness) to a condemnation of the entire world . A mass riot of destruction now breaks out at the auditorium, but Vijay escapes. With Vijay’s existence now publicly known, there is another public meeting held to which Vijay is invited in order for him to recite his poetry and verify his identity. But at the event, he rejects them all and tells the people who now worship the poet Vijay that he is not that Vijay. In the final scene he goes to Gulab’s apartment to tell her that he is going far away – and to her rapturous joy, he invites her to accompany him. 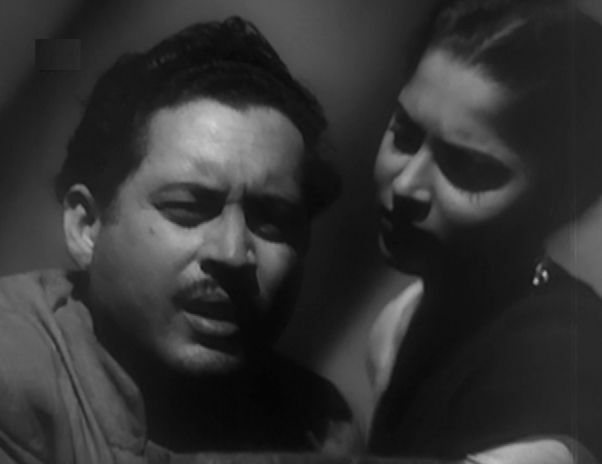 There are undoubtedly great strengths in Pyaasa. The moody, in-depth compositions and shadow-laden photography are evocative and memorable. Guru Dutt’s existentially intense performance, as well as Waleeda Rehman’s soulful characterization are also irreplaceable . And the way the song lyrics are integrated into the narrative as poetic manifestations makes the musical element that much more meaningful. The outlandish ham acting on the part of many of the characters, particularly Vijay’s odious brothers, is disturbing. This gross overacting goes well beyond expressionism and becomes off-putting for the viewer. There are absurdly improbable coincidental meetups that have no narrative motivation. Vijay and Gulab keep running into each other at unlikely moments. Despite the employment of in-depth compositions, there are not enough establishing shots to signal scene transitions. This is particularly a problem when it comes to time displacements, such as flashbacks. Surprisingly, there are numerous jarring jump-cuts that interrupt the narrative flow. These are visually disturbing and pull the viewer out of deep involvement with the story. Many of these problems were less in evidence with Dutt’s subsequent film, Kaagaz Ke Phool. Although the production teams for the two films were largely identical – with the same cinematographer (V. K. Murthy), editor (Y.G. Chawhan), and musical composer (S. D. Burman) – it is my understanding that the production budget for Kaagaz Ke Phool was two-and-a-half times that of Pyaasa. So perhaps with the latter film there were more resources and time available to reshoot scenes and work out problems in the editing room. One significant production staff difference, though, was the lyricist. For Pyaasa, the lyrics were composed by Sahir Ludhianvi, who I understand was an established poet. Because of some differences with musical composer Sachin Dev Burman, this was their last collaboration, and the lyrics for Burman’s music in Kaagaz Ke Phool were composed by Kaifi Azmi. All in all, I preferred what seemed to me was Burman’s more soulful music in that latter film. 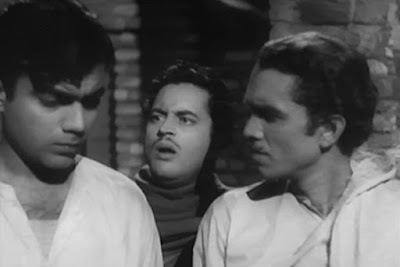 Nevertheless, perhaps Ludhianvi’s lyrics in their original language are very special and account by themselves for Pyaasa’s greater domestic popularity – I only react to the subtitled lyrics, which of course cannot remotely capture poetic expressions in their original form. Another difference between the two films is their endings. Kaagaz Ke Phool ends with defeat and death, truly expressing existential despair. 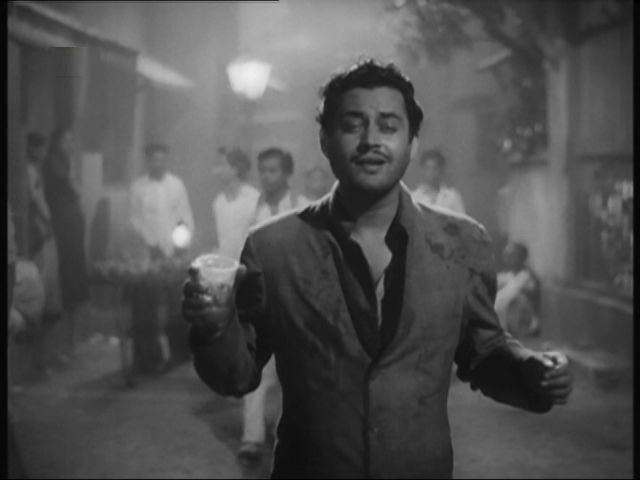 Pyaasa, on the other hand has a more upbeat ending. It is my understanding that Dutt originally wanted Vijay to wind up alone – the more positive ending, with Vijay and Gulab together, was imposed on Dutt by the distributors . Perhaps it was this commercially-imposed ending that helped made Pyaasa the more financially successful film. 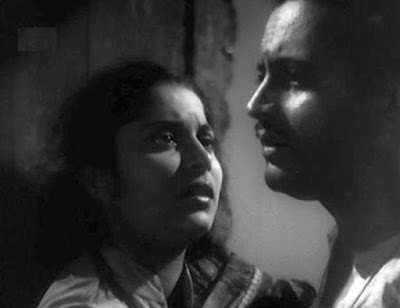 On a thematic level, as I mentioned above, Pyaasa incorporates a social justice theme that goes beyond the existential themes of love and personal ambition underlying Kaagaz Ke Phool. But, to me, pride and ego dominate the Vijay character in Pyaasa more than justice does. For example, his poetic complaint about city prostitution districts in Act 3 seems to be more a concern about something that besmirches India’s reputation than it is about injustice towards women. In fact Vijay doesn’t really love. At least Devdas, even with all his self-pitying, loved Paro (and similarly in Kaagaz Ke Phool Suresh loved Shanti). But fans of Pyaasa perhaps believe that Vijay is more principled than Devdas, and hence more worthy than those other characters. It is actually Gulab who truly embodies love, not Vijay. Even though she only first came to know him through his written words, those words resonated with her, and she came to love the man who wrote them. So Gulab’s final embrace of Vijay in that last scene really was crucial. It identified love as their salvation, and, by implication, the world’s salvation, too. Pyaasa is ranked 45th on Murtaza Ali Khan’s 2013 list of all-time greatest films at A Potpouurri of Vestiges. See his review of Pyaasa here: http://www.apotpourriofvestiges.com/2012/04/pyaasa-1957-legendary-indian-auteur.html. In 2005, Richard Corliss of Time magazine ranked Pyaasa as one of the 100 best films of all time, http://entertainment.time.com/2005/02/12/all-time-100-movies/slide/all/. In fact the financial backers of Pyaasa originally wanted to enlist the star of Devdas, Dilip Kumar, to play the lead role, but they could not come to terms. Note also that the music for all three films, which in each case is a major strength of the production, was composed by S. D. Burman. See for example my reviews of The Last Command (1928) and Bicycle Thieves (1948). S. D. Burman admitted that he adapted the tune from a British movie that he had seen. But the allusion seems to be different. In the Bible it is suggested that the great material riches of the world are less than the greater value of one’s own soul. Vijay’s poem here, on the other hand, omits the reference to soul and merely suggests that in its present state the world, itself, is worthless. Guru Dutt and Waleeda Rehman reportedly had a love affair during this period. Viewers may look for their affective chemistry on the screen in this film. “Pyaasa”, Wikipedia, (20 April 2015). What a fantastic piece of writing... finally, we have a review that does full justice to Pyaasa... and I must congratulate you for thoroughly analyzing this Guru Dutt masterpiece! loved this... fantastic... well there is one marathi book written on gurudatt and his work by ftii alumni ,director arun khopkar. this reflects more deeply about work. Thanks for providing a wonderful review for a classic film.